It was nearly midnight by the time the Patriots made their selection during round one of the 2019 NFL Draft and Bill Belichick, as usual, made it interesting. 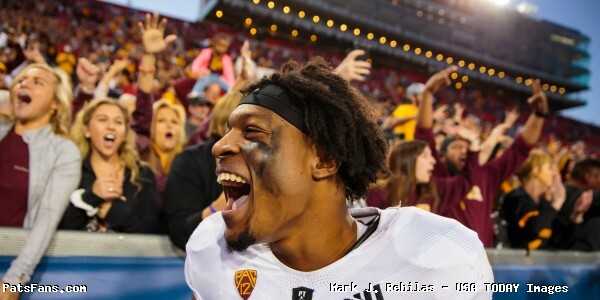 With the 32nd overall pick, the Patriots selected a wide receiver, taking Arizona State standout N’Keal Harry to close out the first round Thursday night. Harry is a big target. 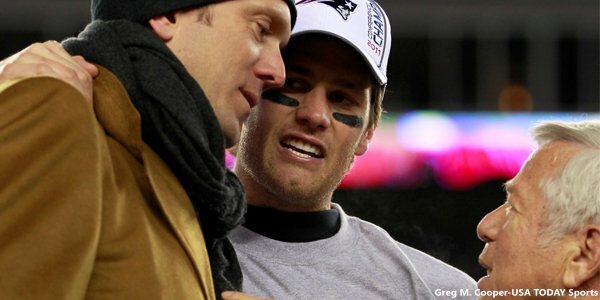 He’s 6’2″, 228 pounds, which would give Tom Brady a big young target who with his size is a great addition. He’s an inch taller than Malcolm Mitchell, who was the last early round selection they grabbed back in round four back in 2016. Mitchell was 6’1″, 200-pounds and had a solid rookie season before injuries ultimately spoiled his seemingly promising career. The fact Belichick made the move is telling, with the team clearly trying to inject some youth and talent into the offense after losing Rob Gronkowski to retirement this offseason. Harry’s addition now gives the Patriots some speed, with the rookie having run a 4.53 40-yard dash during the NFL combine. But one of the things that has stood out in his scouting reports is the fact he’s a strong kid, coming away on the right side of quite a few contested passes during his collegiate career, as well as the ability to break tackles and be elusive once he has the ball in his hands. He’s also got terrific quickness, which as we know from players like Julian Edelman, is certainly an an attribute that is key in this offense. It was the first time the Patriots had taken a receiver in the first round since 1996 when the team selected Terry Glenn back during then Patriots head coach, Bill Parcells, tenure. Parcells was reportedly against the selection after then general manager Bobby Grier and owner Robert Kraft overruled Parcells on the pick for Glenn and it sparked the end of Parcells’ tenure. The move worked out well for the Patriots, who went on to finish 11-5 that season and earn their first Super Bowl appearance since 1986 that season, which ultimately ended with a loss to the Green Bay Packers. Parcells then departed to the New York Jets that offseason. Needless to say, it’s an interesting pick and one that fans can hope will make an early impact this season. The last time a young player made a difference in the offense, the season ended with a Super Bowl championship. While it’s a little early to think that far ahead, it doesn’t change the fact that Harry’s selection will likely add a little more optimism looking at New England’s offense heading into the 2019 season. This entry was posted in 2019 Patriots Draft and tagged 2019 NFL Draft, 2019 Patriots Draft, Bill Belichick, Bill Parcells, Julian Edelman, Malcolm Mitchell, N'Keal Harry, Terry Glenn, Tom Brady on April 26, 2019 by Ian Logue. On Monday morning it was first reported by ESPN’s Adam Schefter that former New England Patriots wide receiver Terry Glenn passed away at a hospital in Dallas, Texas following an automobile accident. Glenn was 43 years old. Glenn played his first six NFL seasons with the Patriots, who drafted him seventh overall in the 1996 NFL Draft. During that timespan, Glenn played in 68 games and recorded 329 receptions for 4,669 yards and 22 touchdowns. He currently ranks eighth in team history in receiving yards and ninth in receptions. In his first year with the Patriots, Glenn made an immediate impact on the team, starting 15 games and setting an NFL record for most receptions by a rookie with 90 catches for 1,132 yards and six touchdowns. His contributions that year helped the Patriots earn an 11-5 regular season record, claim their first division title in a decade, achieve their first playoff victory in Foxboro Stadium and advance to Super Bowl XXXI. As word spread throughout the NFL, former teammates of Glenn along with present players took to their social media accounts to share their final goodbyes and condolences with personal tributes. Loved this man. My son asked me a decade ago who my favorite receiver ever was because he wanted that jersey for Christmas. He got a Terry Glenn jersey from Santa. 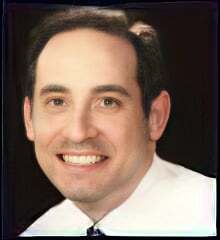 TG overcame horrible adversity to become a really good man. May your soul rest in peace my friend. Rest In Peace to my former teammate Terry Glenn, my prayers go out to his family. Gone to soon. Very sad to hear about the loss my teammate Terry Glenn! A man with a remarkable story. He had himself in a much better place before he passed! God bless you & your family! RIP my friend! So sorry to hear about the passing of Terry Glenn. Sending thoughts and sympathy to his family, friends, and fans. Bill Belichick on the death of Terry Glenn: "Deep down inside, he was a good person with good intentions and a good heart. … It's a sad day." Also shared were some highlights during Glenn’s Patriots career. Including… the first one ever thrown by Tom Brady. This entry was posted in NFL Commentary, NFL News, Patriots News, Patriots Video and tagged Damien Woody, Drew Bledsoe, Jermaine Wiggins, Julian Edelman, Kevin Faulk, Lawyer Milloy, Matt Chatham, Randy Moss, Scott Zolak, Terry Glenn, Troy Brown on November 21, 2017 by Robert Alvarez. On Wednesday, the New England Patriots announced that wide receiver Julian Edelman has been named the AFC Offensive Player of the Week following the teams 35-14 victory over the Miami Dolphins. The honor marks the first time in Edelman’s career he has earned a weekly award. 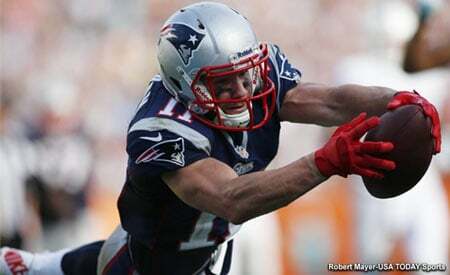 Edelman caught eight passes for a career high 151 yards against the Dolphins. It was his second 100-yard receiving game of the season and the 11th of his career (nine regular season, two postseason). In the third quarter Sunday, Edelman scored on a 77-yard touchdown pass from Tom Brady, a career long. His previous best was a 69-yard touchdown at San Diego back on December 7th, 2014. Entering the game versus Miami, Edelman needed just 45 yards to gain 1,000 for the season. He finished 2016 with a career high 1,106 and joins Wes Welker (5), Rob Gronkowski (3), Randy Moss (3), Stanley Morgan (3), and Terry Glenn (2) as the only Patriots with at least two 1,000-yard seasons per the Patriots press release. 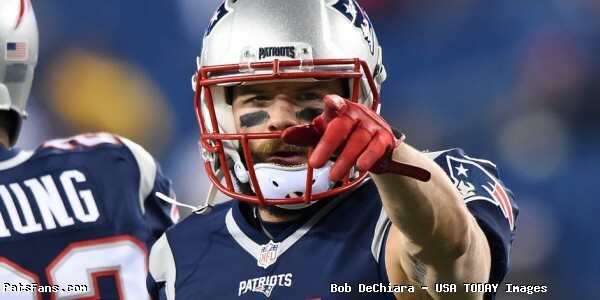 Edelman’s selection marks the ninth time a Patriots player has earned an NFL honor in 2016. Quarterback Tom Brady was named AFC Offensive Player of the Week following his Week 5 return at the Cleveland Browns along with Week 11 at the San Francisco 49ers. He was also named AFC Offensive Player of the Month for October. Other Patriots to earn honors in 2016 included punter Ryan Allen as AFC Special Teams Player of the Week in Week 3 versus the Houston Texans, LeGarrette Blount was named AFC Offensive Player of the Month for September, kicker Stephen Gostkowski was named AFC Special Teams Player of the Week following Week 1 versus the Arizona Cardinals and Week 13 versus the Los Angeles Rams . Lastly, linebacker Dont’a Hightower earned AFC Defensive Player of the Week for his performance against the Cincinnati Bengals in Week 6. This entry was posted in Patriots News and tagged Dont'a Hightower, Julian Edelman, LeGarrette Blount, Randy Moss, Rob Gronkowski, Ryan Allen, Stanley Morgan, Stephen Gostkowski, Terry Glenn, Tom Brady, Wes Welker on January 4, 2017 by Robert Alvarez.